* Note: This is NOT another Market America shill article spreading propaganda. This is a genuine no-nonsense criticism of Market America's business opportunity using logic, facts and common sense. "It can be very difficult, if not impossible, for most individuals to make a lot of money through the direct sale of products to consumers. And big money is what recruiters often allude to in their pitches." "You'd be hard-pressed to find anyone making over $1.50 an hour. The primary product is opportunity. The strongest, most powerful motivational force today is false hope." Back in 2000, I responded to a "business opportunity" ad in a newspaper in Bellingham, WA. 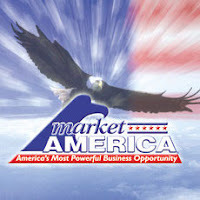 It turned out to be for Market America, which touted itself as being one of the best business opportunities in America. I attended these overly enthusiastic meetings which employed cult-like brainwashing techniques, group pressure, and sensational promises. But what I found out eventually is that in truth, Market America's business opportunity was just another MLM (Multi-Level Marketing) scheme, aka Network Marketing, dressed up in fancy terms in an attempt to disassociate itself from the negative stigma of MLM's. Here are some of its core misleading false claims vs. reality. This video is a bit misleading in a number of ways. First, even if there is a vertical downline of commissions, still, the system says that in order for everyone in your downline to benefit, everyone must recruit at least two people (which of course cannot go on forever, so someone is guaranteed to lose out), so if you recruit two people and they recruit two others and so forth, of course the downline is going to have a pyramidal structure, regardless of the commission structure. Second, notice that the presenter put "100 percent" next to every level of the downline to make it look tantalizing. He said that everyone in your downline, including yourself, receives 100 percent of the BV (commission points) generated by the person at the bottom level. But this is a mere mind trick to make it look big. 100 percent can apply to anything, for example, 100 percent of $1 is $1 - it does not make $1 bigger than it actually is. Let's use some common sense here. There is no free lunch and no free money. Even if Market America's commission structure was a little better than Amway or other MLM's, it can't be that much better, or else the company would lose money. They cannot pay everyone more than the net profit earned, or else they would lose money. This is common sense. Third, note how he says that Market America has to cap everyone's earnings at $3600 per week, indirectly implying that it is so easy to reach $3600 per week, that they have had to cap it to make it fair, lest a ton of people exceed it, as if this cap really made a difference. Yeah right. It's as if we are supposed to think "Awww shucks, the most I can make is $3600 a week. Darn. I was hoping to make more!" Uh huh. It's a cheesy psychological trick to make you think that $3600 a week is easy to achieve, without directly telling you so. My gosh. Even though I can see through it, it's too bad there are many suckers out there who will not. In reality, less than one percent of distributors make anywhere near that amount. Most of them make little or nothing, or end up losing money (see the sourced statistics from Wikipedia below). "Multi-level marketing (MLM) is a marketing strategy in which the sales force is compensated not only for sales they personally generate, but also for the sales of the other salespeople that they recruit. This recruited sales force is referred to as the participant's downline, and can provide multiple levels of compensation." As you can see, this definition fits Market America to a T at the nuts and bolts level. NOTHING in Market America's business plan, downline structure or commission plan differentiates itself from this. Changing or altering a downline structure or commission plan, or repackaging itself with new terms and labels does NOT change that. Thus, Market America has no right to say that it is not an MLM. It's only doing so to avoid the negative public stigma of MLM's and of course to make itself look "special". So when you break it down, it's the same nuts and bolts as a standard MLM in that: You have to recruit a minimum of two great salespeople who then have to be trained to recruit a minimum of two more great salespeople, and so forth, and of course, the products have to be sold by all of you in order to earn commissions (known as BV in Market America). All MLM's work that way, regardless of how they dress themselves up. It's not anymore complicated than that. So in reality, they are really no different because they all work the same way at the nuts and bolts level - and at that level the system is fundamentally flawed (more on that below). Thus, their claim of not being an MLM is unsubstantiated. "MLM companies have been a frequent subject of criticism as well as the target of lawsuits. Criticism has focused on their similarity to illegal pyramid schemes, price fixing of products, high initial start-up costs, emphasis on recruitment of lower-tiered salespeople over actual sales, encouraging if not requiring salespeople to purchase and use the company's products, potential exploitation of personal relationships which are used as new sales and recruiting targets, complex and sometimes exaggerated compensation schemes, and cult-like techniques which some groups use to enhance their members' enthusiasm and devotion." Sound familiar? Again, that fits Market America to a T, and the video above of its compensation plan is an example of an "exaggerated compensation scheme". It's no wonder that Market America is desperate to disassociate itself from the term MLM due to this bad rap. 2. Market America distributors claim that you don't have to be good at selling to succeed in their business. They tell this to all new recruits in order to not discourage them when they object "But I'm not good at selling". It's a total lie and a stupid one at that. Of course the product has to be SOLD. Where else is the money going to come from? Duh. Do you think your commissions are going to grow on trees? One way or another, the products have to be SOLD, and that involves SELLING. So this lie by Market America is an insult to human intelligence. In fact, you not only have to be good in sales, but also in RECRUITING and TRAINING as well, since you have to recruit people and train them. And all this for a low probability venture in which most people fail. (See stats below) Is that really worth it? Think about it. a) Retail sales jobs are easy, because you are in a store where people come to buy stuff. All you have to do is be friendly and helpful and provide good customer service and they will buy stuff. That's why retail jobs tend to be minimum wage, because they are easy. You are selling to people who want something. But when you are selling to people who do NOT want what you are offering, that's a whole different ballgame. And Market America is just that. With Market America, you are not selling to real customers who are seeking your product. You are selling to people who are NOT seeking your product - everyone you can find out there, including your friends and family, who may start to avoid you if you keep pressuring them, needless to say. Most people do not want to join an MLM and find its products to be overly priced, so it's a huge uphill battle. In order to recruit people, you have to use some deception and illusion, which is what MLM schemes always do, because the system can't sell itself at its nuts and bolts level. Regardless, you have to be an incredible sales person and a great recruiter, but even then, you will get a lot of rejections, and you will have to use exaggerations and misleading claims as well. Common sense should tell you that if a system is good, it will not need to exaggerate or mislead, only bad systems need to employ such tactics. b) If you are selling something of value that is worth its price, then those who need it will buy it, if you can get it to them. In that case, you do not need to be good at sales. You just need to be friendly and helpful and provide good customer service. But in Market America's case, its products are overly priced, which is the usual case with MLM products, and therefore in order to sell overly priced products, one must have exceptional sales ability, or the ability to use deception, illusion and misleading tactics. c) In Market America, you are not just selling a product, which is hard enough as already explained, you are selling a DREAM as well - the dream of becoming self-employed and financially independent. That's how you recruit people and create a downline to try to multiply your commissions, by selling them a dream. Needless to say, dreams are a concept and therefore harder to sell than products are. Either way you look at it, you have to SELL the products and RECRUIT others to SELL the product as well. There's no way around it. That's a fact, even if Market America denies it. After all, your commissions are not going to come from the tooth fairy. Come on now. In order to sell and recruit, you have two options: Start with your friends and family and social network. If that fails, then you have to go out and talk to random strangers or place "business opportunity" ads in newspaper classifieds. Now ask yourself: Do you really want to do that? Do you want to harass strangers like that and try to mislead them into some vague "business opportunity" that you can't even be upfront about? Do you want to put vague "business opportunity" ads in newspaper classifieds to lure people in? Isn't that all very shady and predatory and unnatural? How does your conscience feel about that? And all this for a low probability venture in which most people fail too. (See stats below) Is that really worth it? Think about it. 3. Market America claims that if you work hard and follow their formula/teachings, you are guaranteed to succeed. This is also not true, and anyone with real entrepreneurial experience can tell you that. Business and reality don't work that way. Let me explain why. 1) Not everyone can be at the top in a niche. There isn’t room. 2) You can’t succeed by just following a formula. It doesn’t work that way. Too many other factors come into play, such as talent, passion, drive, dedication, luck, timing, market demand and availability, your network, social skills, personal charisma, karma, destiny, divine will, and other intangibles. You see, you can’t just emulate a successful person by doing what he/she did and get the same results, at least not in business. Do you think you can just copy everything Bill Gates did and get the same results he did, especially since he beat you to it and is already at the top of the pyramid? Let me give you another example. Can an Olympic gold medalist teach you how to win a gold medal? Even if he/she tried, can you just do everything he/she did and win a gold medal yourself? Nope. It doesn’t work that way, because there are many other factors that caused the athlete to win a gold medal, and formulas are not it. Besides hard work, talent, luck, timing, karma, divine will, etc. also affect the outcome. Some people are also good and talented at a certain niche, while others aren't. The same applies in business. Timing is crucial in a market. You have to be one of the first in the niche or category to establish a base. If you are not, then it’s much harder for you to compete. If you are the first to start something unique that works, then you have a much better chance. For example, if you had started an online auction before Ebay, you would have had the chance to make it big in a new market. But you can’t start an online auction now and compete with Ebay. No way. To make it, you have to start something that’s not been done before, or improve on an existing niche or specialty, which others have not before. So you see, it’s not that simple as following a formula. What you gotta do is this: Figure out what you do best and capitalize on that. Discover what your gifts are. Look for innovative ideas that fulfill what people want. And never quit. That’s what you gotta do. Hope that makes sense to you. Furthermore, the MLM formula itself is mathematically guaranteed to fail for the majority of its distributors, as I will explain in the next section below. 4. Market America insinuates that the majority of its distributors are making money and doing well. (whatever that means) This is one of its BIGGEST LIES. Nothing could be further from the truth. All evidence and statistical research points to the exact OPPOSITE. "Robert FitzPatrick, who runs PyramidSchemeAlert.org and works as an expert witness in lawsuits against multilevel marketing companies, says state and federal government officials simply can't or choose not to police multilevel marketing companies as much as he believes is necessary. FitzPatrick says "virtually all" consumer salespeople who work in multilevel marketing lose because the recruitment-based marketing can only bring in so much money. Each level always has to be bigger than the last level, and the "vast majority always have to be at the bottom."" Wikipedia's sourced stats on MLM's show overwhelmingly that most people end up making little or nothing, or losing money. * The Times: "The Government investigation claims to have revealed that just 10% of Amway's agents in Britain make any profit, with less than one in ten selling a single item of the group's products." * Scheibeler, a high level "Emerald" Amway member: "UK Justice Norris found in 2008 that out of an IBO [Independent Business Owners] population of 33,000, 'only about 90 made sufficient incomes to cover the costs of actively building their business.' That's a 99.7 percent loss rate for investors." * Newsweek: based on Mona Vie's own 2007 income disclosure statement "fewer than 1 percent qualified for commissions and of those, only 10 percent made more than $100 a week." * Business Students Focus on Ethics: "In the USA, the average annual income from MLM for 90% MLM members is no more than US $5,000, which is far from being a sufficient means of making a living (San Lian Life Weekly 1998)"
* "While earning potential varies by company and sales ability, DSA says the median annual income for those in direct sales is $2,400." * In an October 15, 2010 article, it was stated that documents of a MLM called Fortune reveal that 30 percent of its representatives make no money and that 54 percent of the remaining 70 percent only make $93 a month. The article also states Fortune is under investigation by the Attorneys General of Texas, Kentucky, North Dakota, and North Carolina with Missouri, South Carolina, Illinois, and Florida following up complaints against the company. * "Roland Whitsell, a former business professor who spent 40 years researching and teaching the pitfalls of multilevel marketing": "You'd be hard-pressed to find anyone making over $1.50 an hour, (t)he primary product is opportunity. The strongest, most powerful motivational force today is false hope."" Of course, if you fail, like most do, they will say that the fault is with YOU, not the system, because the system is proven to work, so if you don't make it, then you must have not put in the right effort. This is the way fanatical followers rationalize to protect their belief system. Every religion with cult-like devotion does the same. But even if you become one of the less than 5 percent of people who succeed in an MLM like Market America, and make good money, consider this. Your income is UNSTABLE. It's NOT smooth sailing residual income from there, as they claim. Wanna know why? Because even if you have a profitable downline under you, people quit, fail and drop out all the time and at any time. And when that happens, your business is thrown into chaos and you lose money, and have to train your downline to recruit more people again. So it's a neverending struggle that doesn't end even if you get in at the top. Besides its misleading claims, Market America is not risk free either. You have to invest a ton of time going to its meetings, which are mostly filled with rhetoric, and you will be pressured to go to seminars and pay for them, which could cost $70 - $100 each, and don't really help but are just pep talk rallies using cult-like techniques to manipulate your emotions and incite enthusiasm and fanatical devotion in you. Then if you join, you have to pay a startup fee which costs at least a few hundred dollars, and then you are required to purchase some product from Market America, and then the pressure is on. You have to sell those products or you lose money. And you have to recruit others as well, who must be good at selling and recruiting, or none of you will make real money. It's a lot of pressure in a low probability venture. At its nuts and bolts, the system is discouraging and a low probability venture with many uphill struggles and misleading claims, believable only to the brainwashed. That's why they have to use deception, illusion and misleading tactics to incite your emotions, subdue your logic, and fill you with religious fanaticism, so that you will sell and recruit, even in a losing game. It's all really sick when you think about it. It's no wonder why MLM's have a negative public stigma, which is well deserved. Thus it's no surprise why Market America distributors are trained NOT to tell potential recruitees that their system is an MLM. In fact, if you Google "Market America Scam" you will find many shill sites planted by its reps, containing the usual sales cliches and rhetoric. If Market America was such a good system, why would it have to plant shill sites on the internet about it? Honest people and organizations with nothing to hide do not need to use shills, for truth does not need shills. - "If Market America's system is so good, why do they need to use deception and misleading claims?" 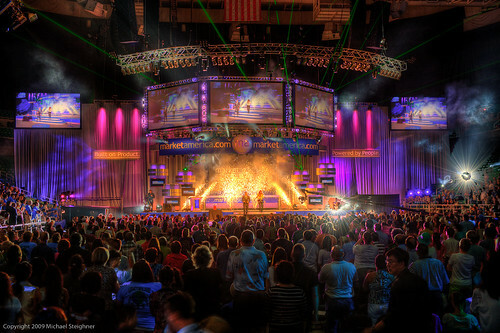 - "If Market America's system is so good, why do they need to seek you out and advertise to you?" - "Why does Market America need to plant shill sites on the internet to catch Google search terms such as "Market America Scam"? Does truth need shills to protect it?" - "Why do you have to pay for seminars and invest in their products? Why do you have to pay a sizable amount to even join?" - "Why do you have to recruit others to join in order to make money? Isn't that taking advantage of others? How does your gut and conscience feel about that? Doesn't it feel shady?" In any case, check out this article I wrote long ago about MLM's where I use simple math to explain why the MLM system is guaranteed to fail for the MAJORITY of those in it. His best audio interview exposing MLM's, in which Market America is mentioned by a caller. - Check out the blog of Market America's Founder and CEO, JR Ridinger: http://www.beingjrridinger.com/ Look at his photo in the header with those dark glasses and sleazy outfit. Doesn't he look like some sleazy con artist sociopath from Las Vegas? He has the look of a Jim Jones type cult leader too. What a bad photo. It doesn't make him look credible at all. Does this look like someone you'd trust? No way. * Note: Market America distributors and reps are welcome to post their responses and rebuttals below. Comments are not censored except for spam, as I believe in free and open speech.